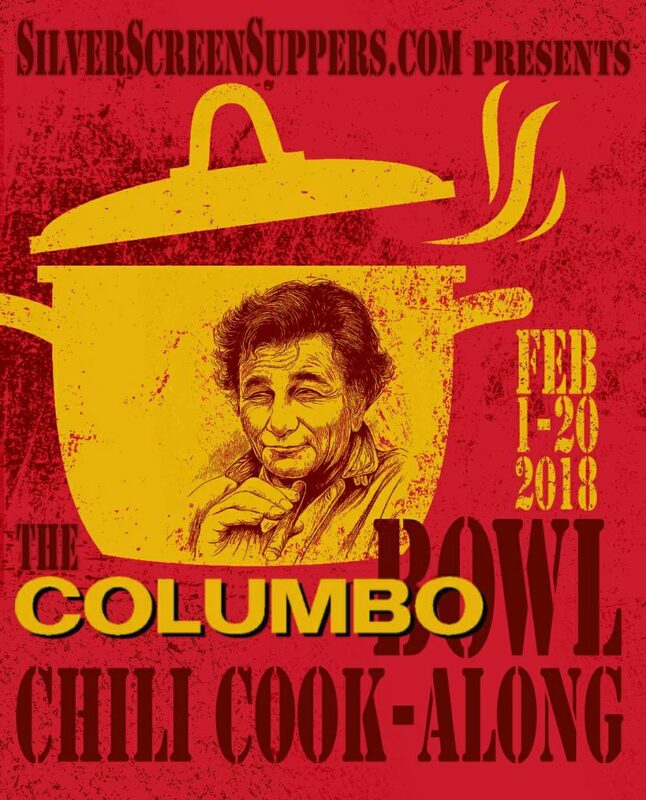 Johnny Cash Chili Columbo Bowl Roundup! 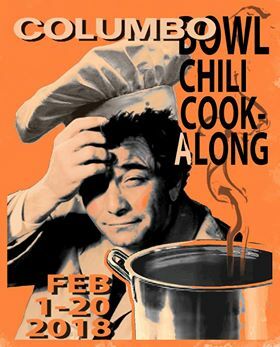 I organized a Columbo Bowl Chili Cook-Along and it was so much fun. Here’s a map showing where in the world Johnny’s chili was rustled up! Over 20 participants! 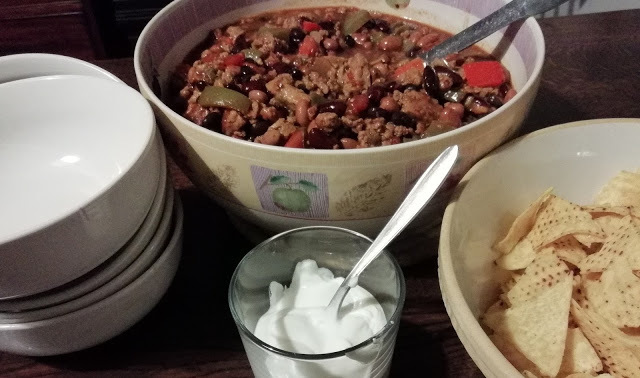 Detroit resident Elizabeth Rottner, a fellow tweeter in the monthly #ColumboTV tweet-along was the first to send pix of her chili (before the cook-along had even officially begun!) and look what an incredible job she did, a step by step guide! 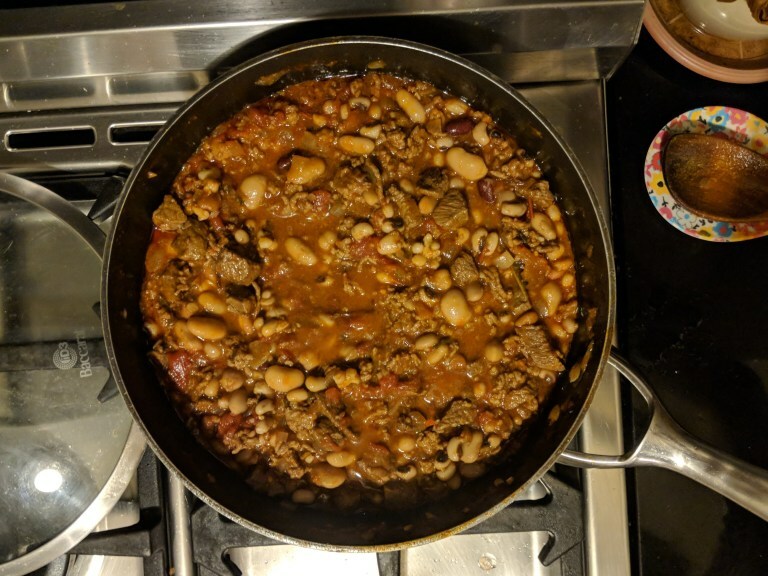 Elizabeth liked the recipe so much, she made the chili twice and said, “It’s now a family favorite.” The second time she made it, she says, “I cut the beans in half (too many carbs for Keto). 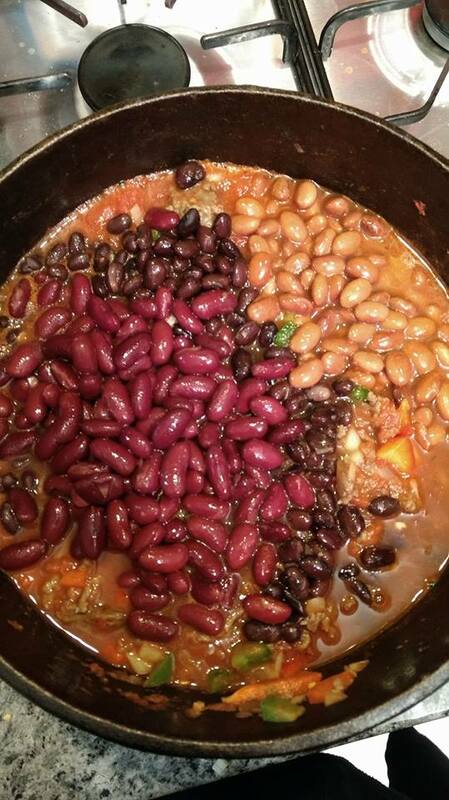 I also cut the spices in half, as the beans cut the heat. This is a spicy chili! 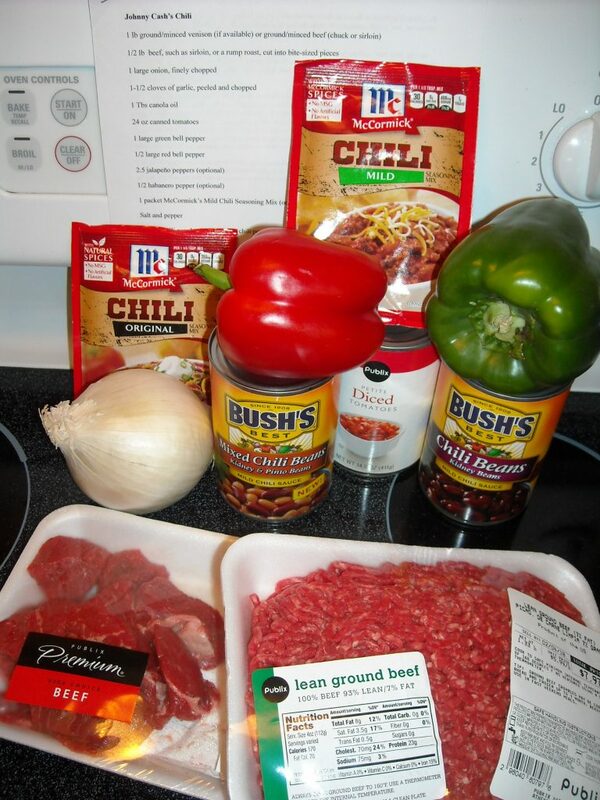 I did add a diced potato as that’s a chili tradition in our family.” Ooh, I do like that idea! Thanks, Elizabeth! That looks mighty fine Mr Owens! 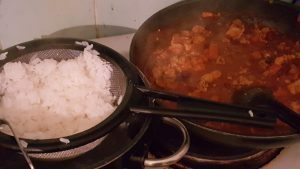 I am very proud that our first British entry involved a serving of RICE, something I know most of my American chums find very odd indeed. I was intrigued by all the different choices for accompaniments made by folks in different places. As the 1st February rolled around, the photos started flooding in! 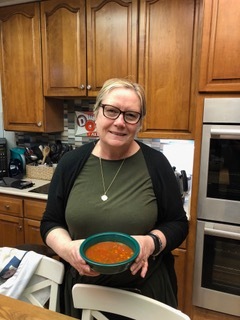 Fellow film archivist Brenda Flora, in New Orleans, who I haven’t seen for TOO LONG tweeted pix of her proudly displaying her big delicious looking pot of chili. 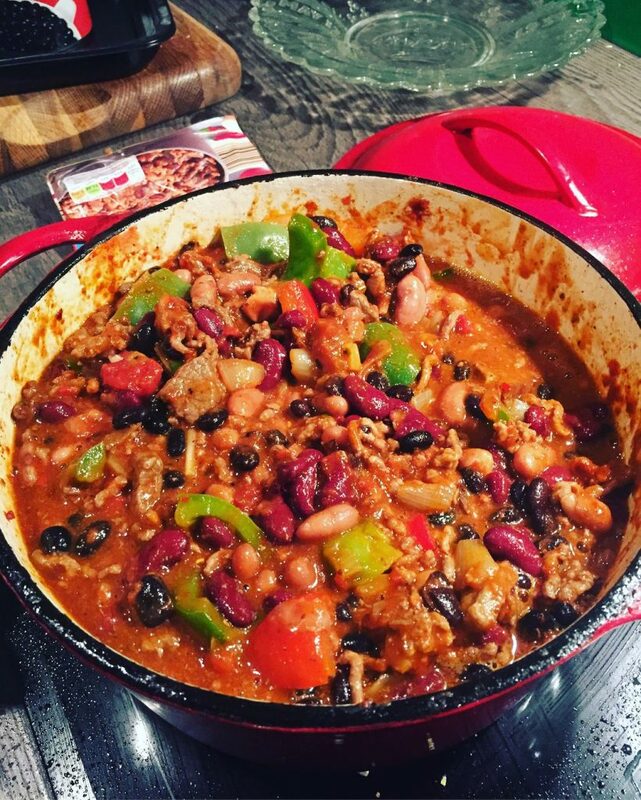 I loved seeing what tins of beans look like in New Orleans via Instagram! Peter Fuller of the Vincent Price London Legacy sent me a pic that made me smile from ear to ear. He’s so creative! Plus, I want that plate! Not only that but also, Peter did a LIVE COOKING DEMO of him making the chili and broadcast it on Facebook. How cool is that? It came in three parts – here’s the denouement! 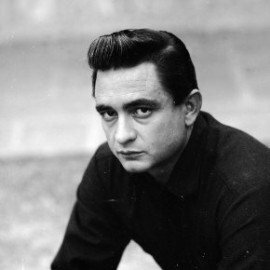 you might remember the scene where the Lieutenant has a bowl of chili at a party thrown by the Johnny Cash character. He’s really enjoying his chili until he is told it is made with squirrel meat! So you can imagine how much I laughed when Paula Otter in Brunswick, Ohio tweeted these pix! She wrote, “no squirrels were harmed in the making of this chili.” Sooooo funny, thanks, Paula! We’ve never met in person, but make each other laugh every month during the #ColumboTV tweet-along. 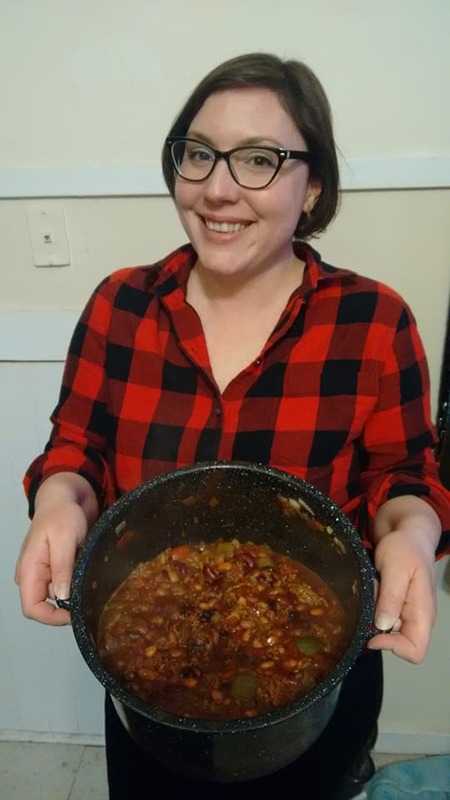 Paula was the first to make the veggie version of Johnny’s Chili that Helen of the wonderful Dinner With Zelda Manners created for this project. Served with homemade crackers – fab! 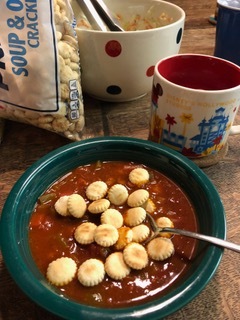 I am sure that the Lieutenant would definitely approve of these instead of saltines crumbled into his chili for a change! 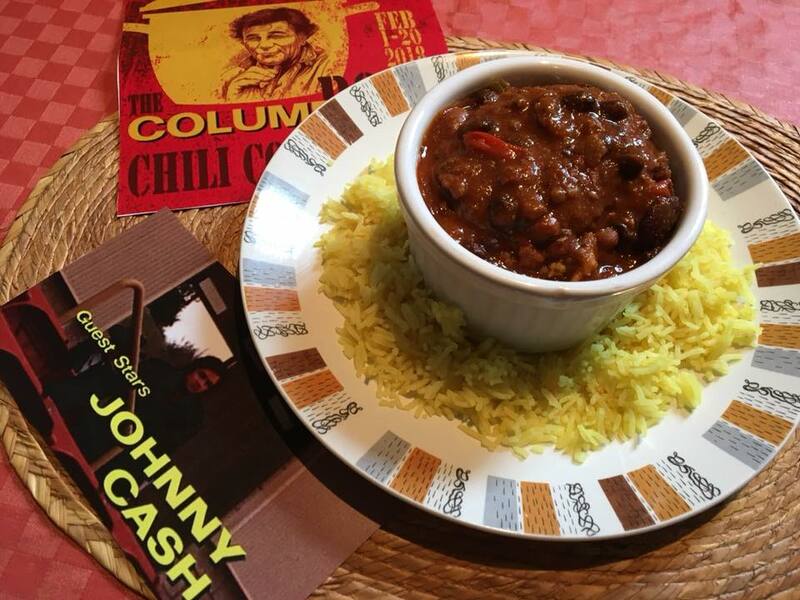 Talking of Dinner With Zelda Manners, Helen in Nottingham, wrote a hilarious post which made me laugh out loud several times about Johnny’s chili – do check it out…. 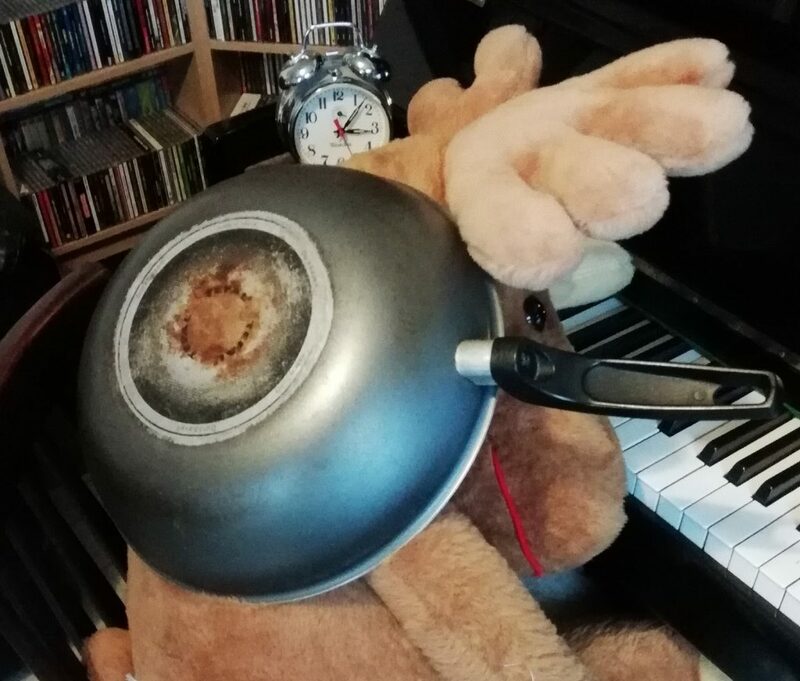 This photo won’t make any sense unless you do! 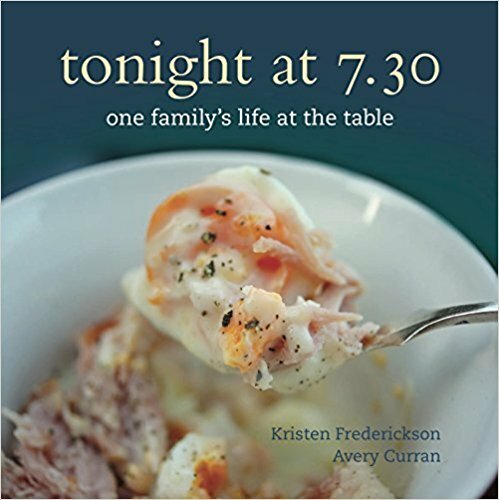 I’d only met Helen once before the book launch party, but we share the same love of cooking, love of old movies, and love of corny jokes and puns (Moose Allison)! 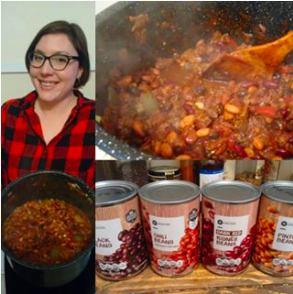 Her veggie version of the chili is DELICIOUS, and I’ve just remembered with great joy that I have some stashed away in my freezer! 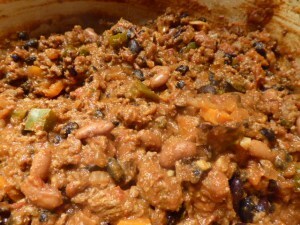 Here’s a pic of the chili Helen made for the cook-along. 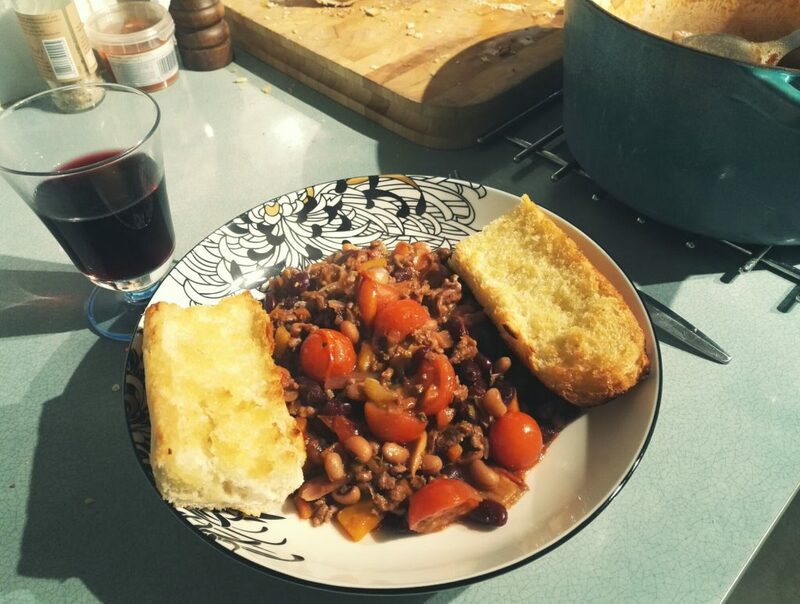 It was so nice to be able to offer up a veggie version so I’m really grateful to Helen for taking the time to develop that great recipe for me. 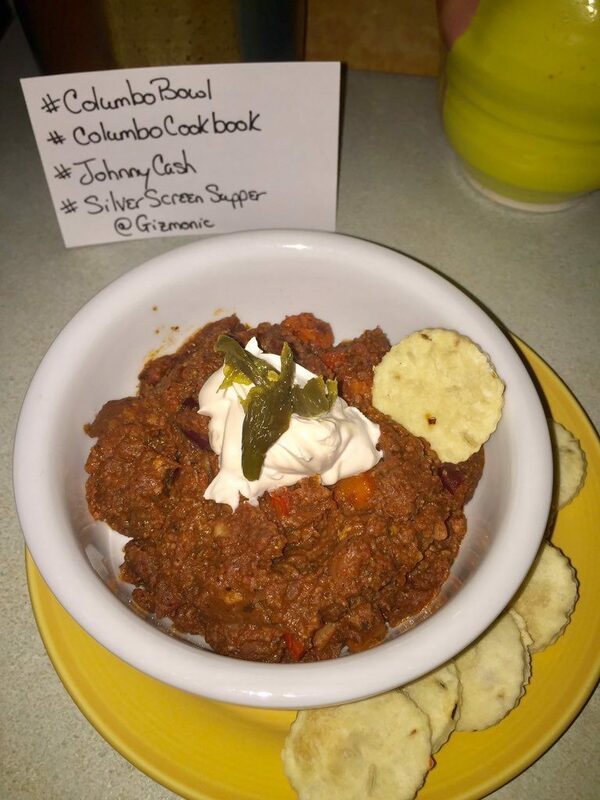 Fellow film archivist Margie in Athens, Georgia made Johnny’s chili to have on Super Bowl night – brilliant! 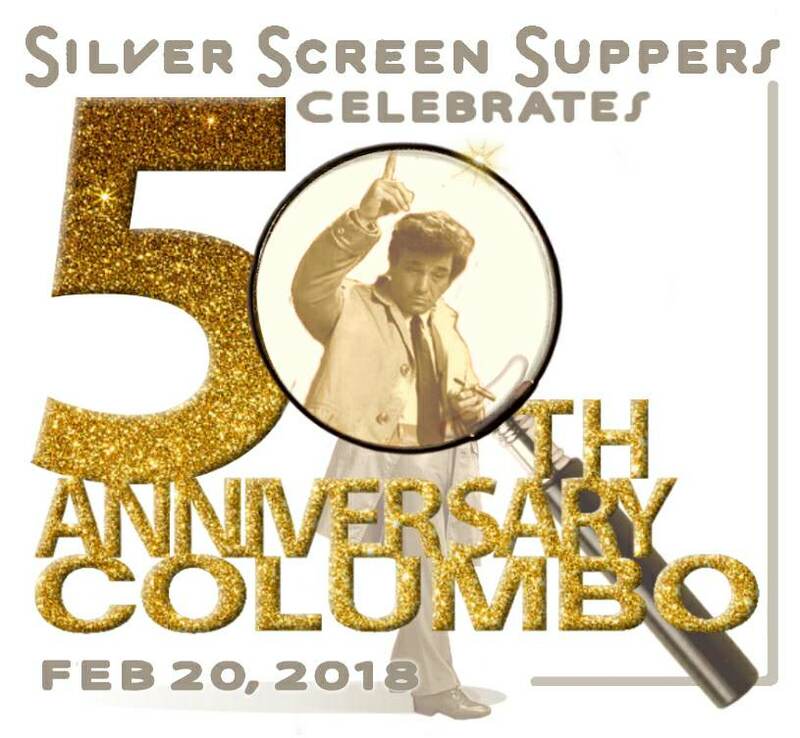 Columbo Bowl for the Super Bowl! I was hoping that someone would do that! 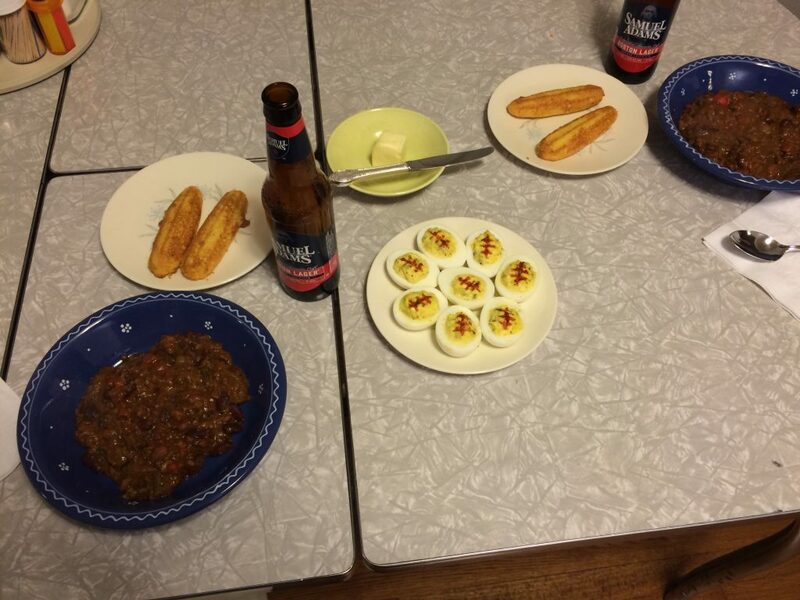 She shared the chili with her dad, and I loved her sweetcorn shaped cornbread sticks. 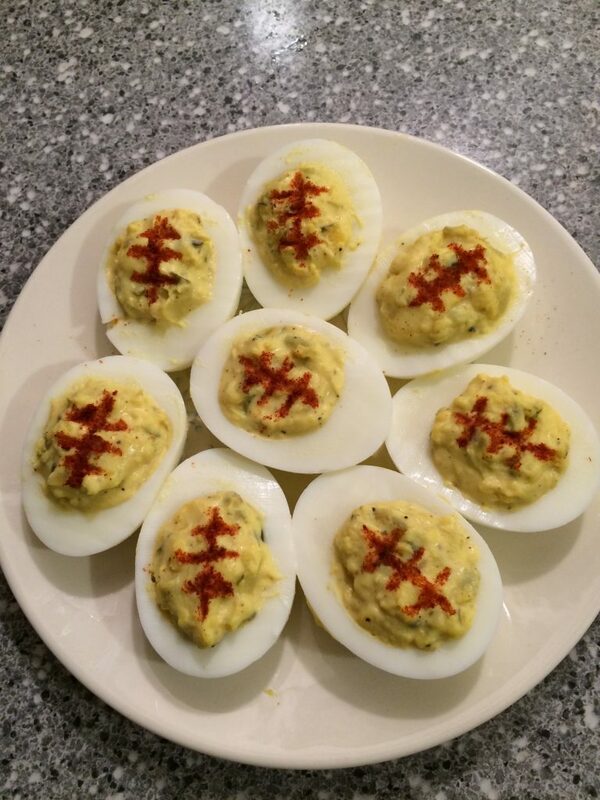 Plus, something I really, really want to make soon, deviled eggs! Check these out – yum! Loving your retro table in the overhead shot of your chili Margie, is that Formica? 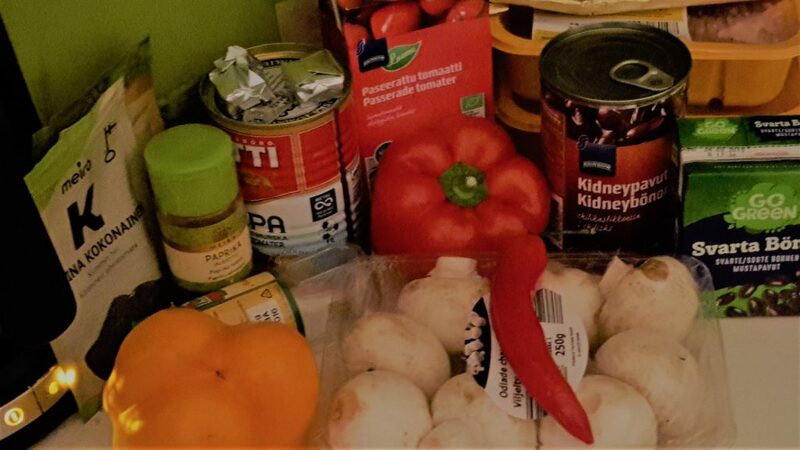 I always love getting a peek into the kitchens and dining rooms of my blog readers, and at the foreign (to me) foodstuffs because I am very NOSY, and I loved this pic Margie sent of all her ingredients with the recipe just peeping out at the back! Margie thought Johnny’s chili was very good! Her only caveat was that it is *extremely filling. * “You don’t have to eat much of it to get quite full! But it’s delicious.” I loved this photo of the beer going in – oh yummy! 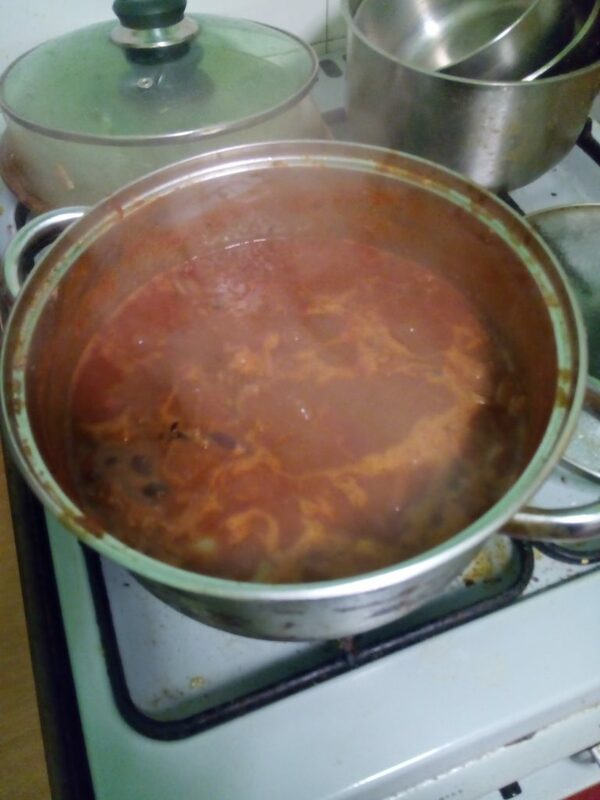 Here are two pix of Matthew Lenton’s chili – I was at Uni with Matthew, and don’t think I have seen him for over 20 years! 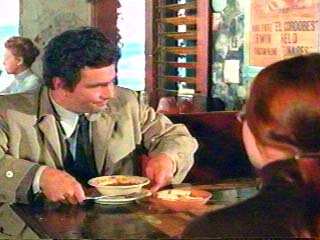 But through the wonders of the internet, he spotted the Columbo Chili Cook-along and joined in. Served with extra cherry tomatoes and French bread – INTERESTING! 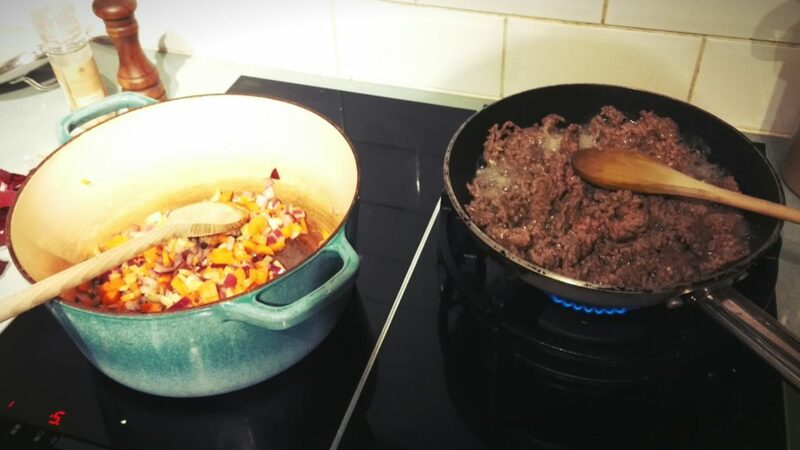 Thanks for these pix Matthew, your chili looks GORGEOUS! But also, Greg made this amazing demonstration video at his home in Zakynthos, Greece. Absolute GENIUS. 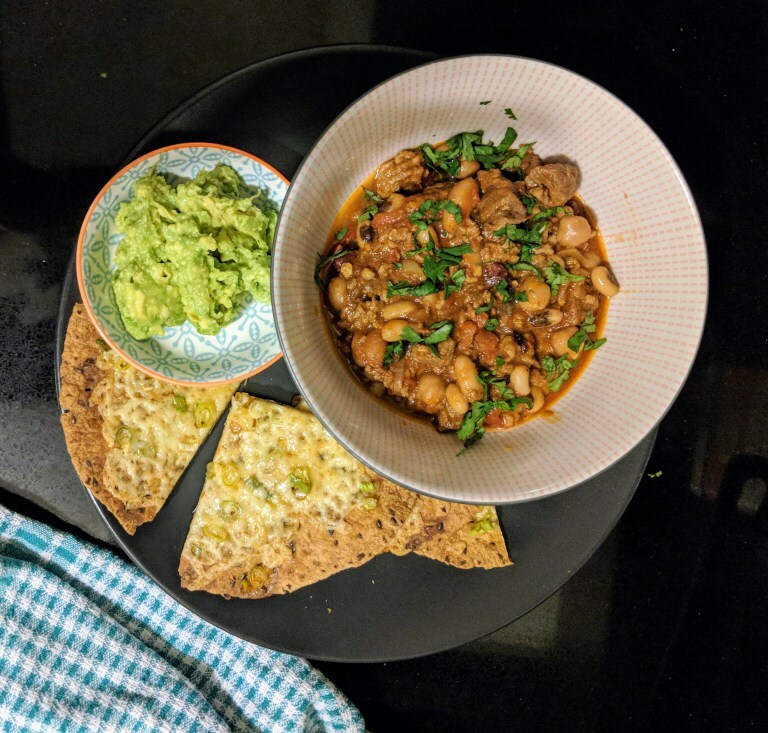 I would never have thought of making a vegetarian chili with halloumi, but this looks absolutely amazing. Greg, you are a total INSPIRATION! 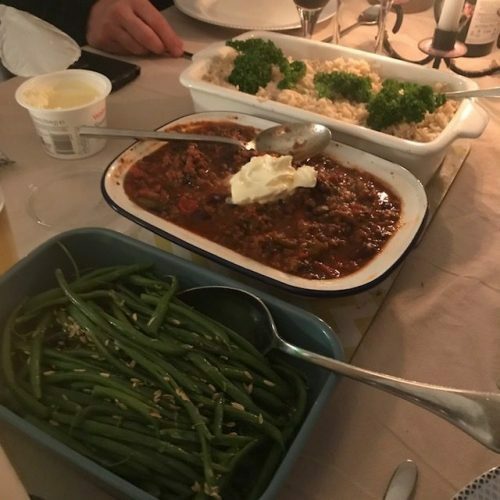 Greg and I have had many discussions about the difference between Americans and Brits, and serving chili with rice is the absolute NORM here in the UK. This is as weird to Greg as the idea of having spaghetti with steak is to me… So Greg served his chili with cornbread with some sour cream and cheese. I am definitely going to try Greg’s recipe for cornbread next time I make some chili, it looks so fab in the video. Greg has also introduced me to the concept of Chili Mac and Cheese. I had never heard of such a thing. But I’m going to try it, especially now I’ve seen Greg’s pic of his leftover Johnny Cash Chili in a Chili Mac and Cheese affair! Mmmmmmmmmmmmmmmmmm!!! One of my long-time resolutions is to get better at taking food photos. Can I pretend that I took the next couple of pics? 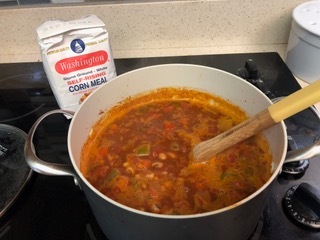 Check out Lynne’s blog for a great recipe for corn muffins to have with your chili and another great idea for leftover chili. 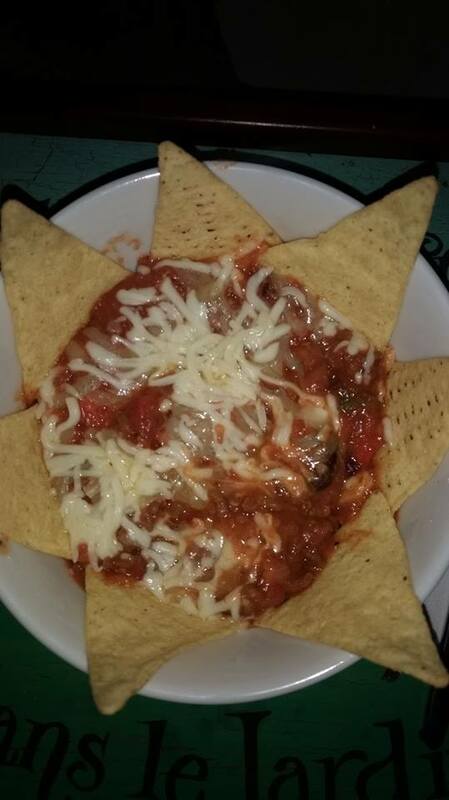 NACHOS – aaaaaaaaaaaaaaaaaaarggggggggggg! The full Moorlands Eater blog post can be read here – if you want to be inspired by amazing photos and delicious food, do visit this brill blog. 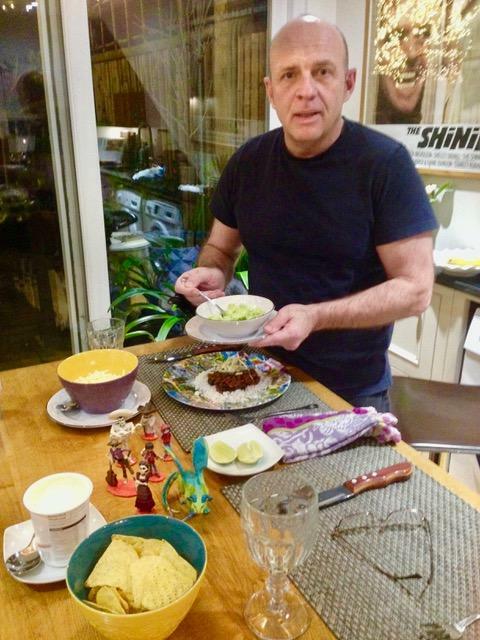 My lovely ex-colleague Luke shared some JC chili with his lovely wife Grace and friends in my beloved Walthamstow, London E17. and the results of his labour – PHOR! Rice! Huzzah! Grace (not seen in the pix as she is taking them) has a fabulous baking blog called Grace and Flavour, let me tell you, her Guinness cake is phenomenal! and the finished dish looks fabulous, served with buttered green beans sprinkled with fennel (yum! ), a big dollop of crème fraîche and brown rice (yes!). 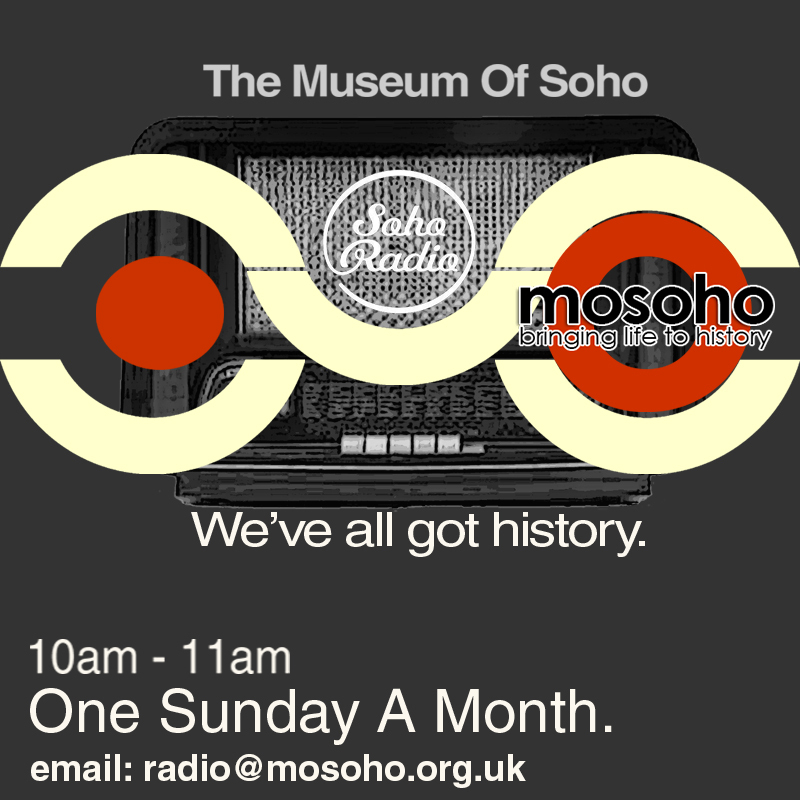 Back in London, my wonderful chum Mark Brisenden of the Museum of Soho Radio Hour sent a great breakdown of how he made his chili and I’m going to use this as a whole blogpost sometime soon! For now, here is a photo of all his fixings… Looks like he already had a sip of the Bud! Cor! 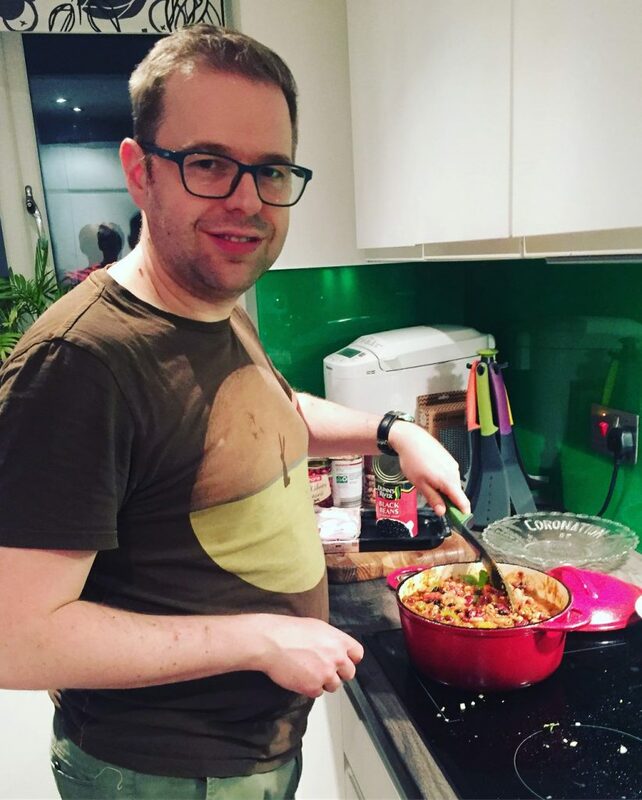 I loved it when Mark tweeted short videos of his chili bubbling away on the hob – it made me so hungry! 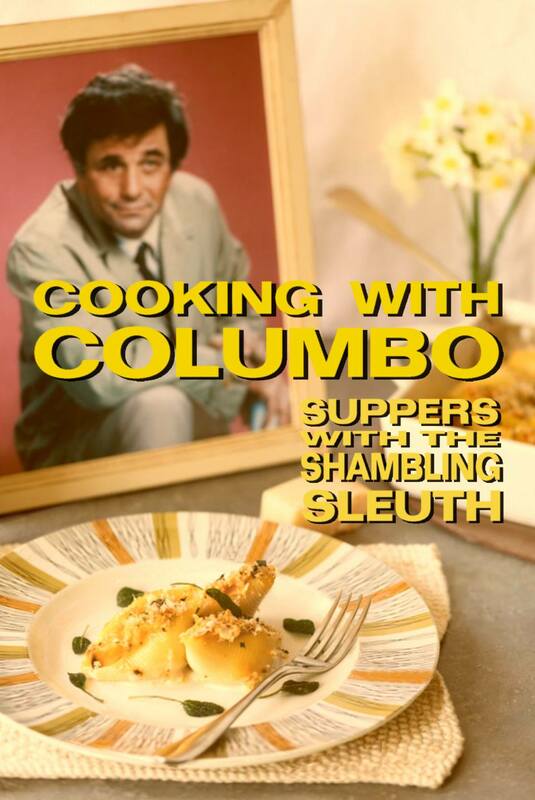 If you missed the episode the Museum of Soho Radio Hour where me and Mark chin-wagged about Columbo for almost a whole hour, you can listen in again here..
My new foodie penpal Annette in Baltimore cooked up a chili despite having a broken leg! Bravo Annette! I’ve been following the leg-mending progress on her blog since she slipped over in the snow. It is ridiculously snowy and slippery right now in London, there is no way I’m going out there! 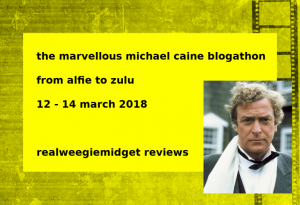 Gill in Lappeenranta, Finland wrote a lovely blog post about making her chili if you are a Michael Caine fan, don’t miss Gill’s Michael Caine Blogathon – coming soon. Naturally, being very nosy, I loved seeing what Finnish fixings looked like! 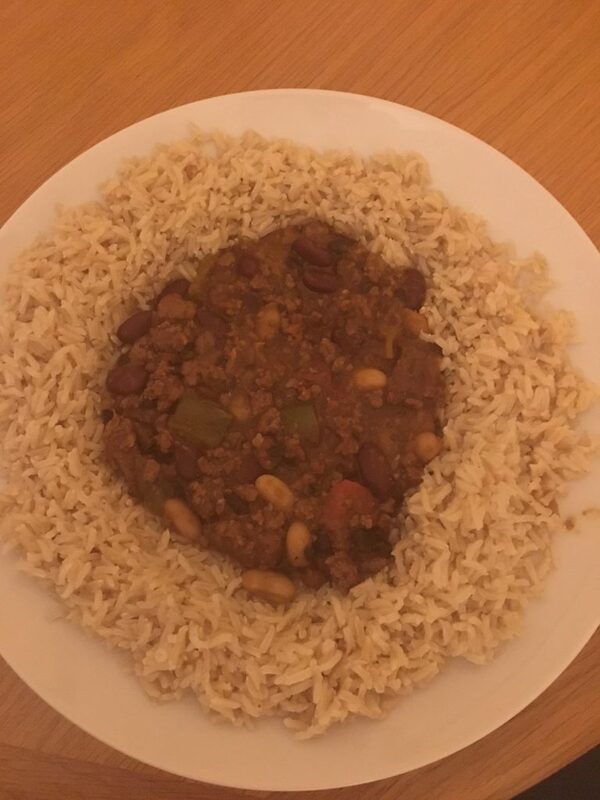 Like the Brits, Gill served her chili with rice. 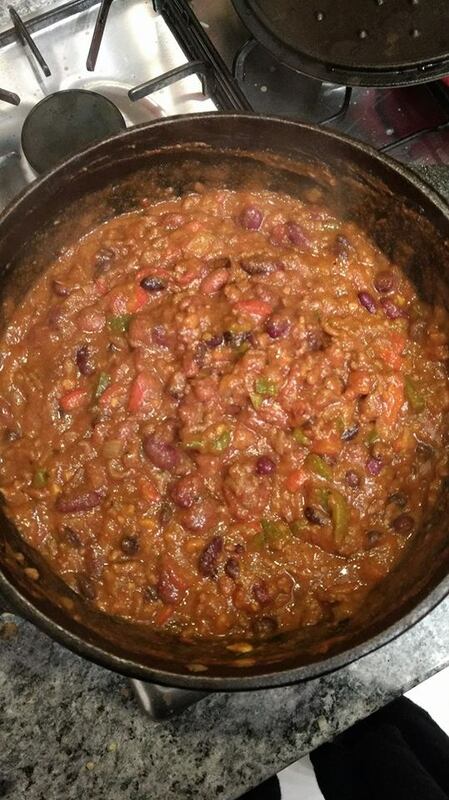 Lots of folks remarked on the amount of BEANS in this recipe, and you can see here in Karla Chameleon’s photo, this is a beany, beany chili! 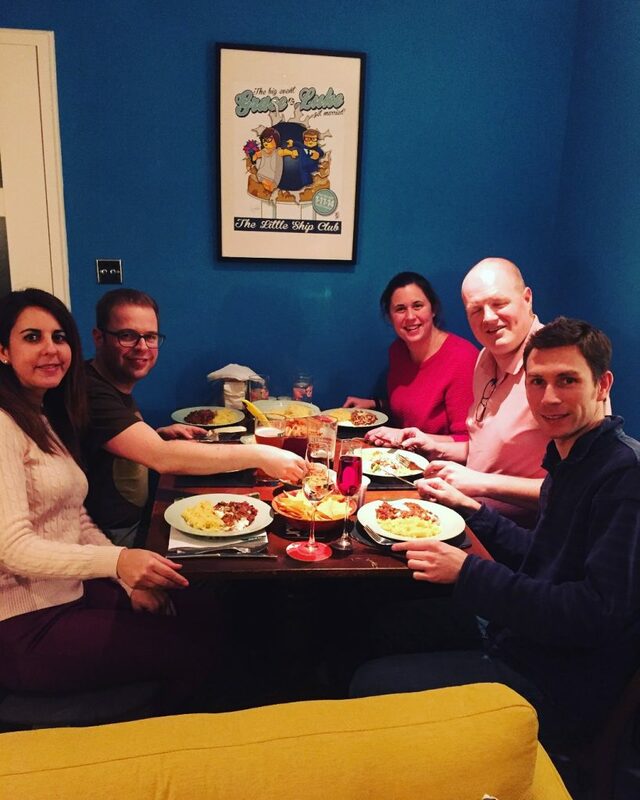 Karla is an American living in the UK so it didn’t surprise me to see an absence of rice in her pic! and here it is on the stove. 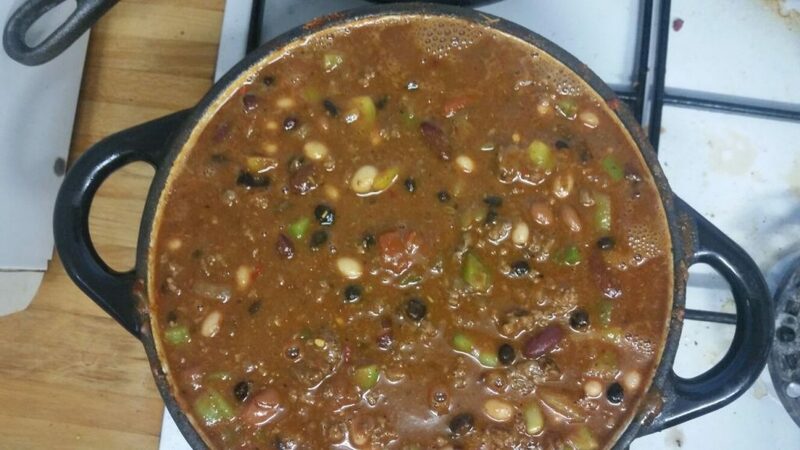 Now that is a HUGE VAT OF CHILI – and my friends, I did HALVE Johnny’s recipe. I basically did that as I didn’t think anyone in the UK would have a pan big enough for the full monty! Sanja’s pan looks perilously full! 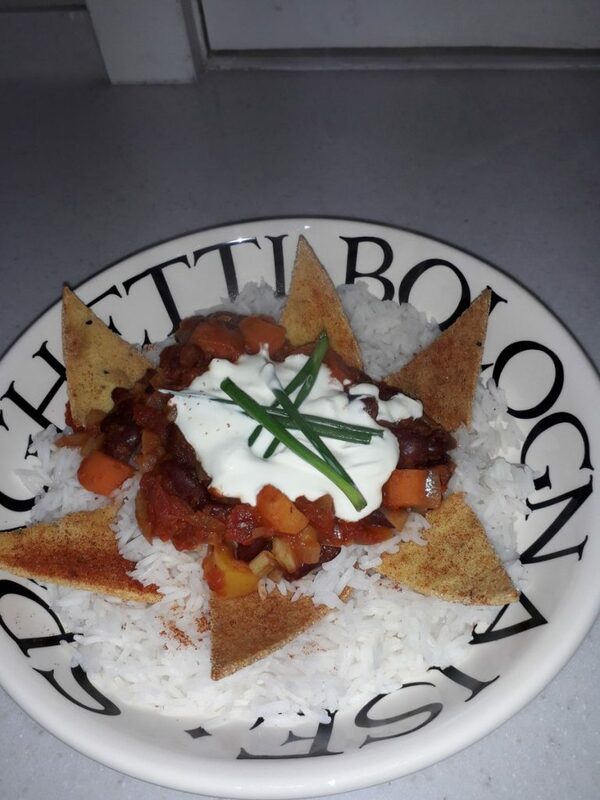 Check out the Double Agent 7’s West London take on Helen’s veggie version of the Johnny Cash Chili! COR! Doesn’t that look good?! 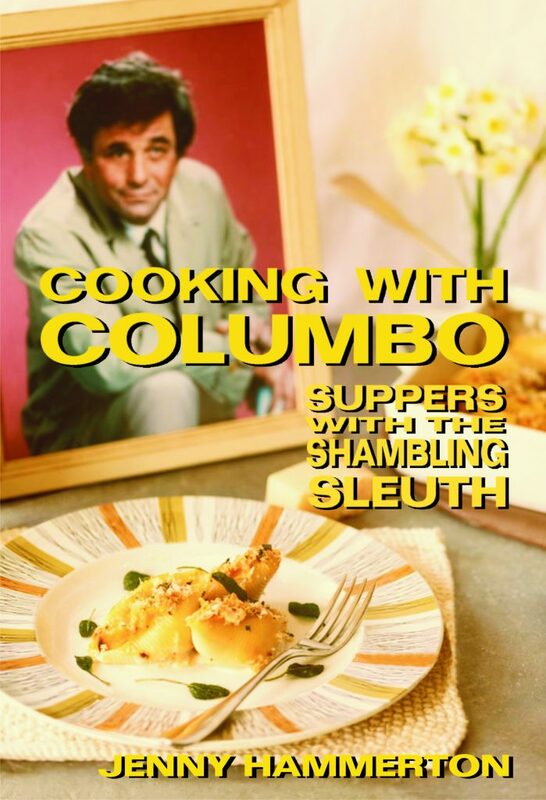 Di was the only person brave enough to test Leonard Nimoy’s Potatoes a La Jolie Chez Jay for the Columbo cookbook. She’s not scared of faggots either! 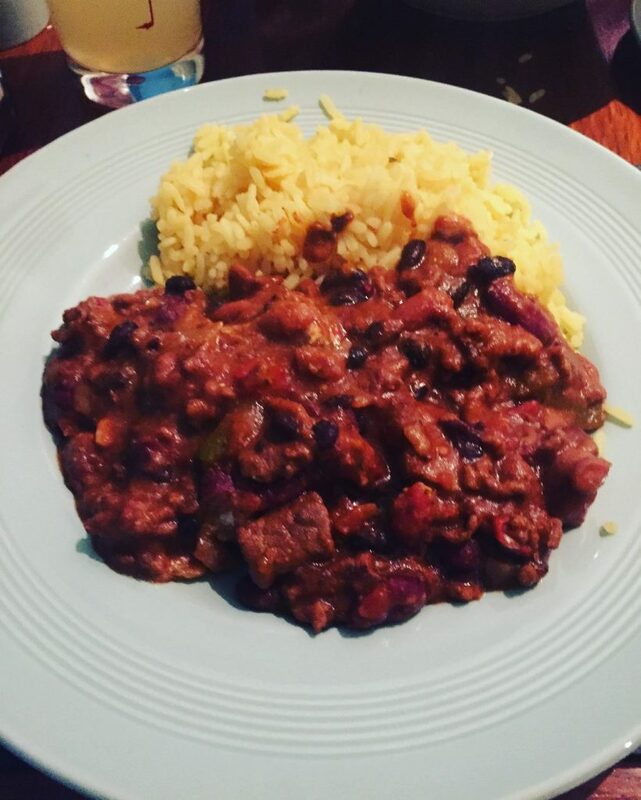 pimped up Johnny’s recipe with characteristic panache. 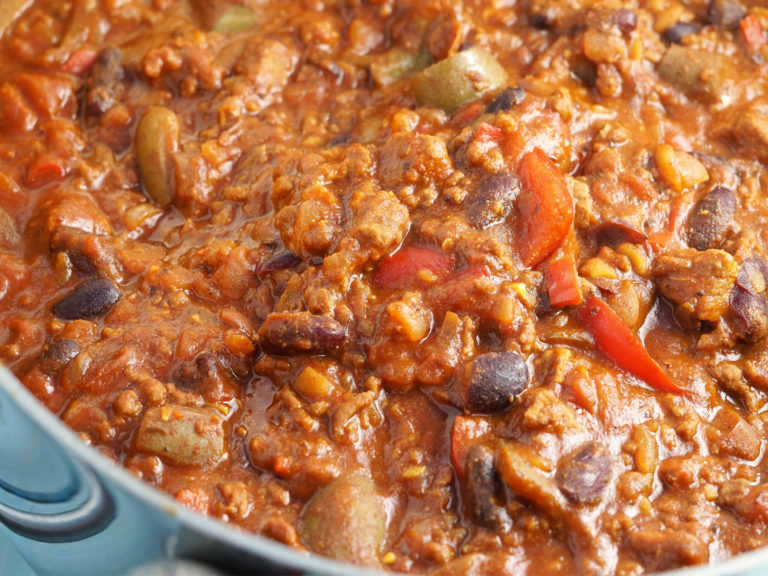 If I tell you her Kristen in London blog post that features the recipe is called World’s Best Chilli With Coffee and Porcini kind of gives it away… I am sooooooooo going to try Kristen’s take on this recipe, because, well, check it out the photo! Mmmmm! 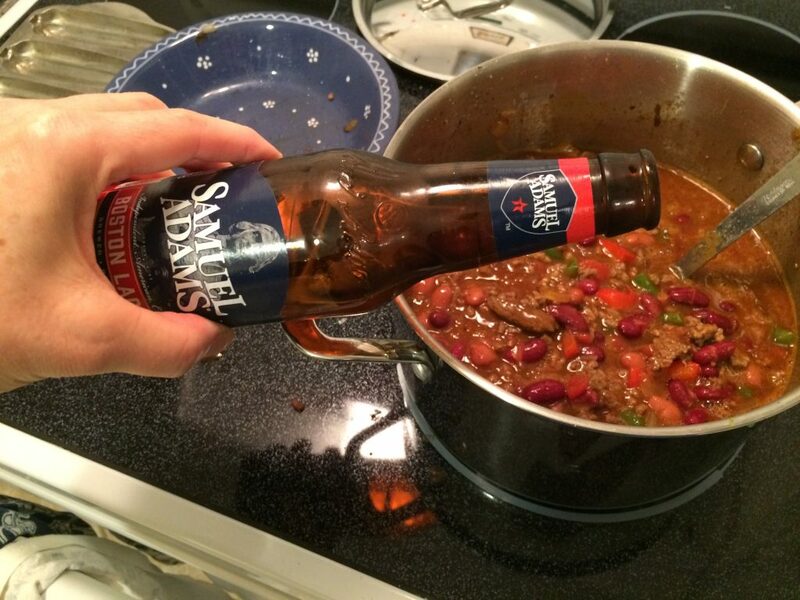 Kristen’s main change was… “I eliminated the beer and substituted coffee! The coffee was used to rehydrate porcini mushrooms and BOY WAS THAT LOVELY!” I bet it was! This is going on my recipe to-do list for sure. What a shame BB, I’m going to send you for a sleepover at The Pioneer Woman’s place. Plenty of cowboys hanging around there, including the very easy on the eye Ladd. 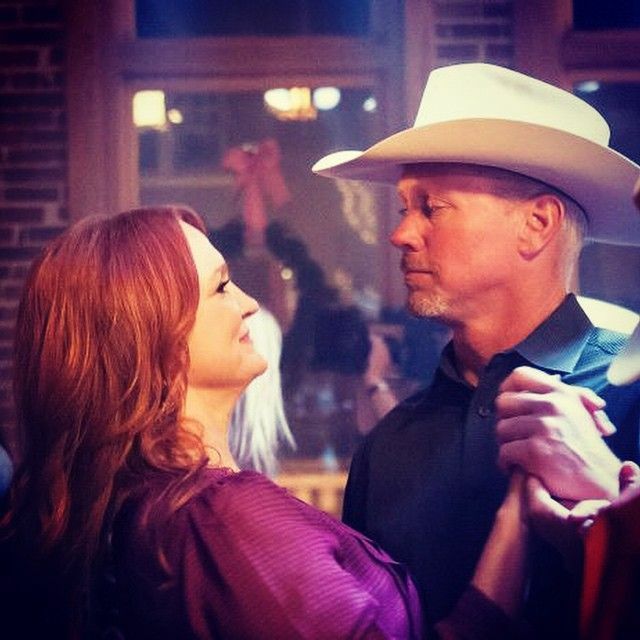 If I am ever in a hotel room, I pray that the Pioneer Woman is on the Food Network channel. A life further from mine I cannot imagine. 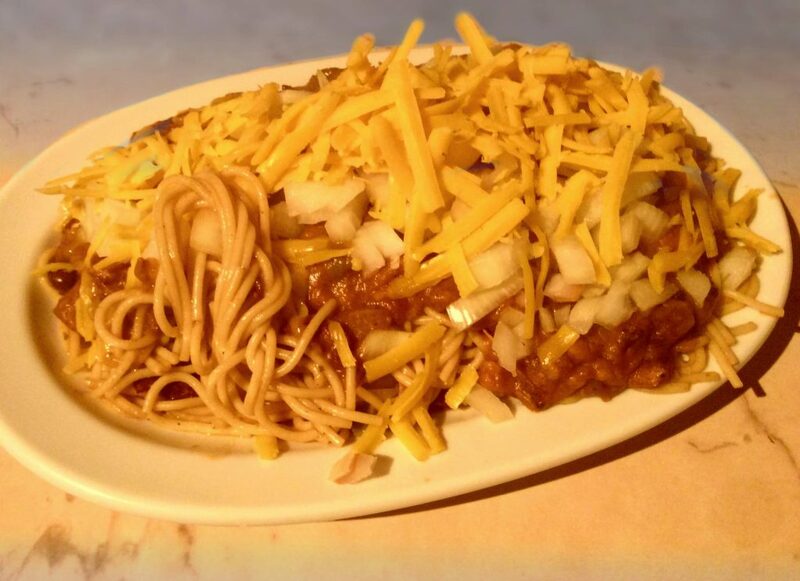 It’s true what Battenburgelle says, Johnny’s Chili is huge. 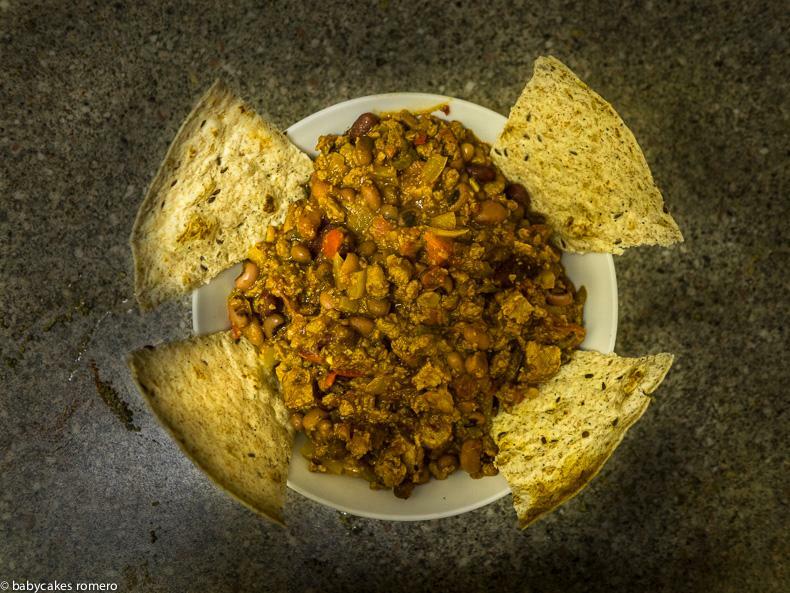 Freezers all over the world are heaving with frozen leftover chili. But who doesn’t want that?! 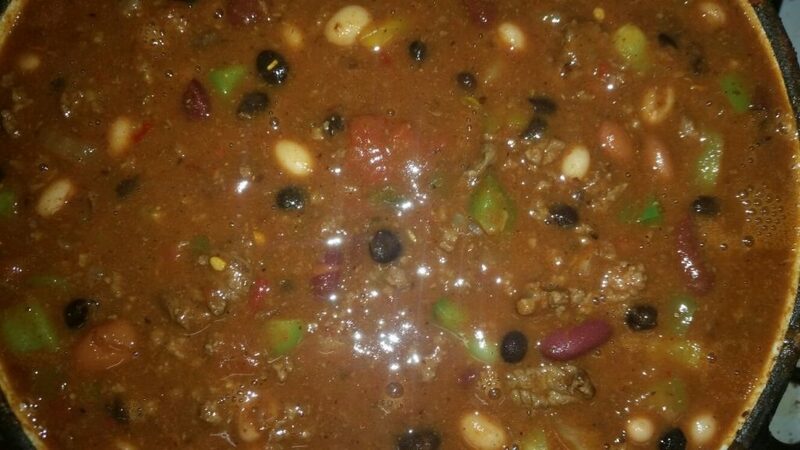 Here’s BB’s chili. I have saved Taryn Fryer’s report until last, as I just love the fact that she’s the furthest away from London it is possible to be. I think I have said before that if I drilled a hole through the centre of the world from my flat and I dropped through it, I’d appear at Taryn’s house in Melbourne. Wouldn’t that be amazing? I know Taryn via her brilliant blog Retro Food For Modern Times and met her in person last year when she came to my flat for lunch as she was in London. Come back soon Taryn, I will cook something less bonkers next time. Taryn’s verdict: “It was/is delicious. 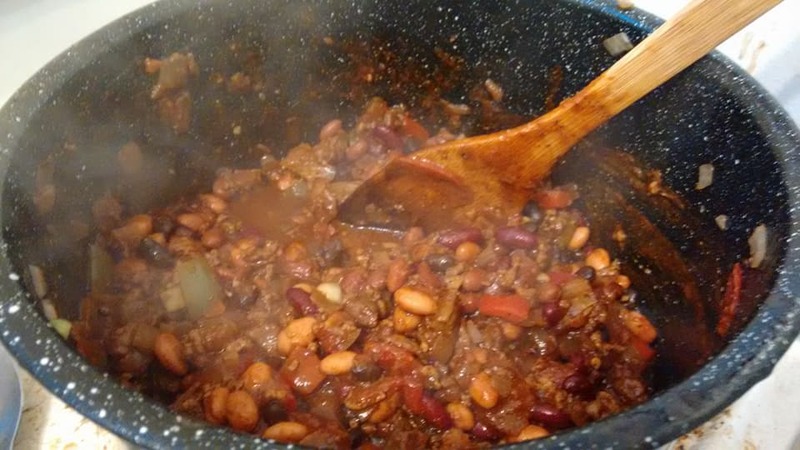 I am having some for lunch today and my freezer is full with many, many future servings.” Haha – I’ve just found the time to check out Taryn’s post about making the chili and there is photographic evidence! WOWZER! That was a LONG post with a LOT of chili! 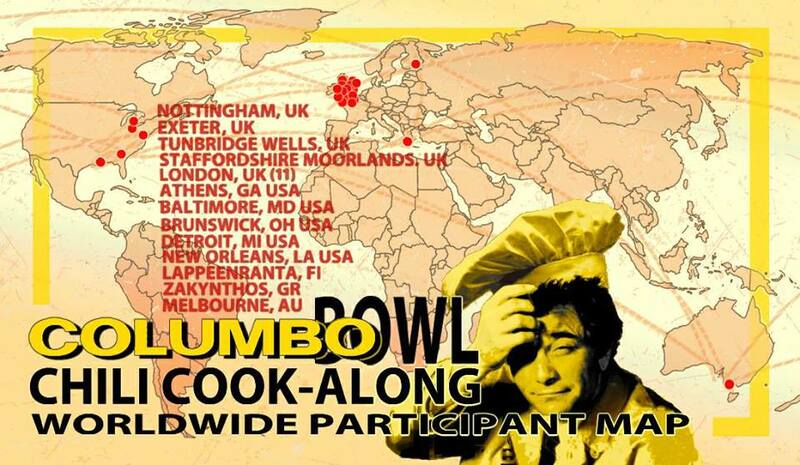 There is only one more Columbo Bowl report, and that’s mine. But I’m going to write that up in another post as this one has taken me DAYS AND DAYS AND DAYS to put together. Also coming soon will be the video of me drawing prize-winning names out of a hat. 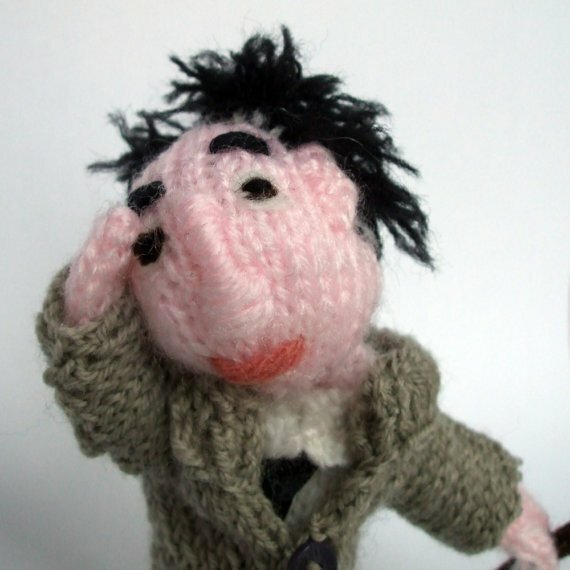 I want Mr R to film the event so that nobody can accuse me of CHOOSING who should win the Columbo finger puppet. 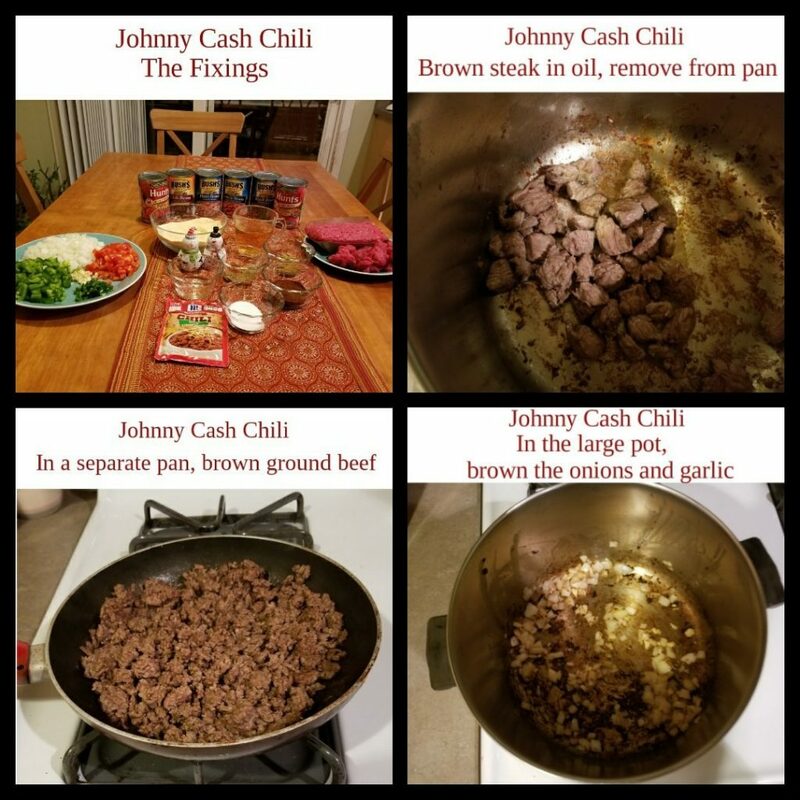 I had so much fun hosting this cook-along and if this post has made you fancy trying Johnny’s chili you can find both the meat and veggie versions here. I can’t quite believe the book is out in the world, but it is! It’s available on Amazon, via Smashwords, and soon you’ll be able to order it from all good bookshops and libraries. Right, my Columbo Widow (Mr Rathbone) would like me to finish this now so we can spend some time together. 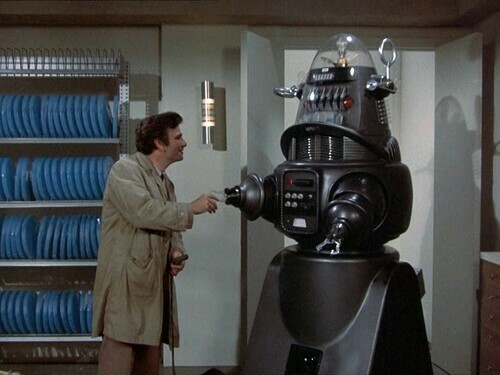 Columbo has taken over my life over the last few months, and I’m supposed to be resting my brain a bit during March. Thanks so much to everyone who participated, your reports gave me so many laughs and so much pleasure. 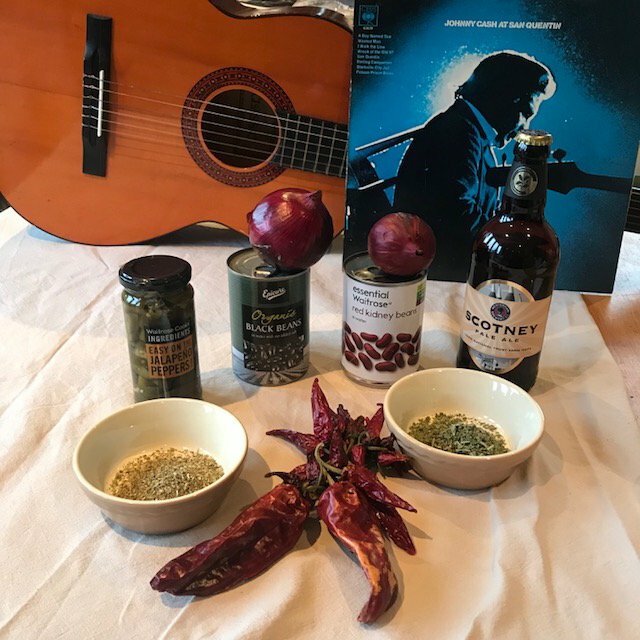 Johnny Cash Chili FOR EVER! 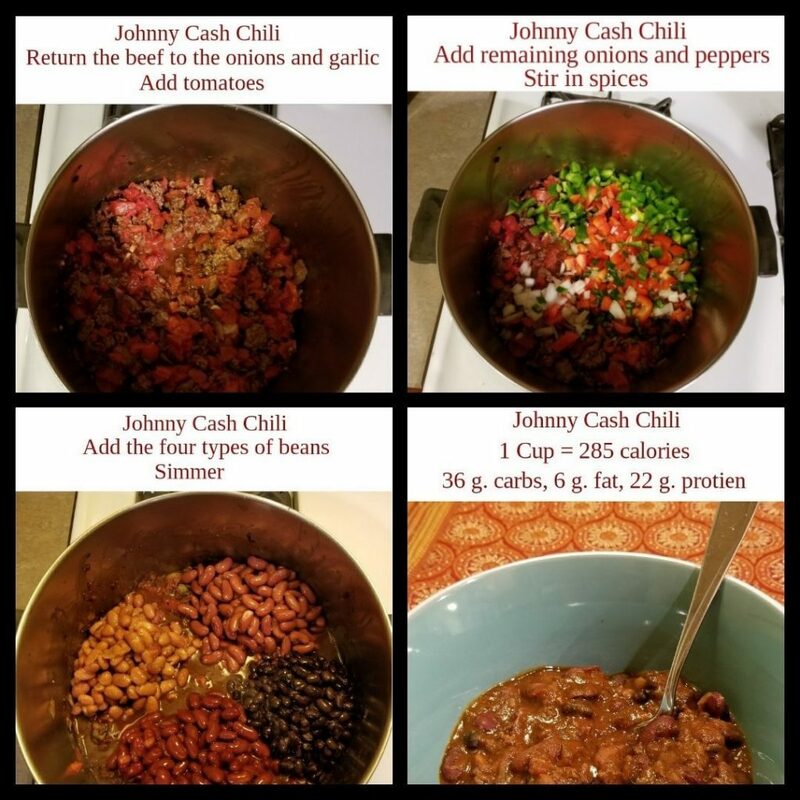 Johnny Cash’s Chilli – Veggie Version! 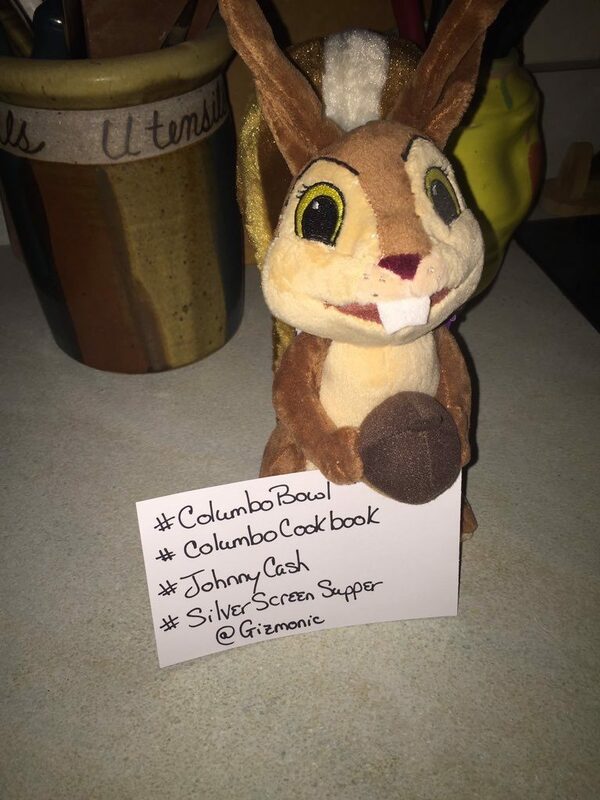 11 Responses to Johnny Cash Chili Columbo Bowl Roundup! What a great round-up! 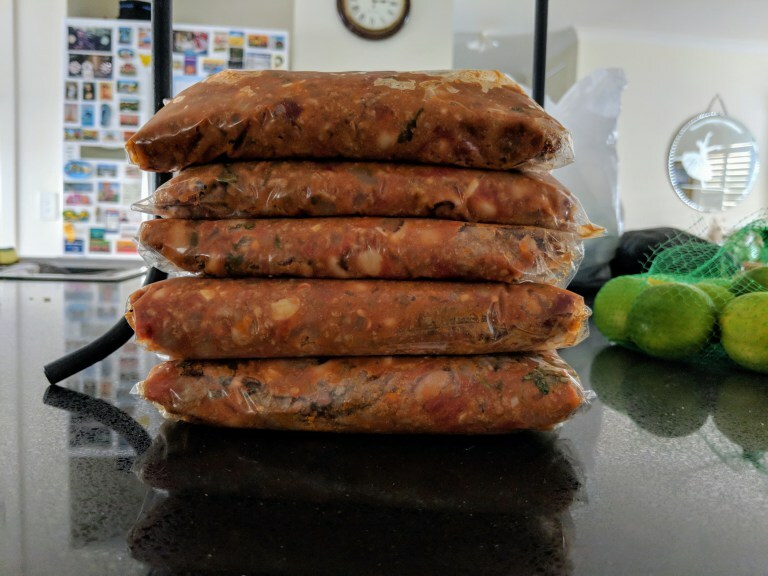 So interesting to see everyone’s take on the same recipe – looking forward to going through all the links, reading the blogs & watching the videos. WOWZER is right! Amazing photos of everyone’s chilies…thanks for all the links, that’ll be about a month of great reading! 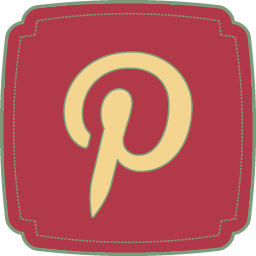 So looking forward to exploring all these new blogs. 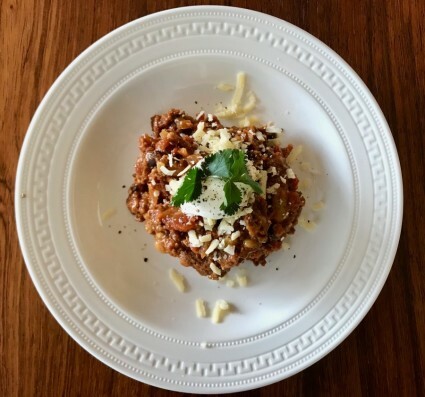 It was such a fun blog post to write, I just loved how differently everyone served their chili – yep, you’ll find some great new blogs to follow! 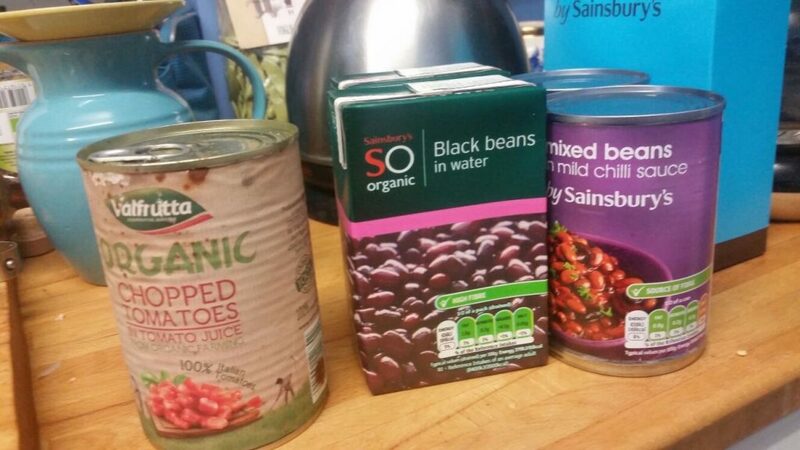 Roll on the next cookalong – hint, hint! Wow! What amazing participation. They all look so good and you can see how much fun everyone had. Epic blog ! I want try them all ! And as a Brit I am controversially on the non-rice side. And I must acquire some basic baking skills as the cornbread and muffins look sensational. Both JC’s and JG’s chili’s are stunners indeed for me JC’s shades for the fresh jalapeno’s and extra spice seasoning that really come through whereas JG’s with that sugar at the end makes it too sweet for myself and others I’ve fed it to. 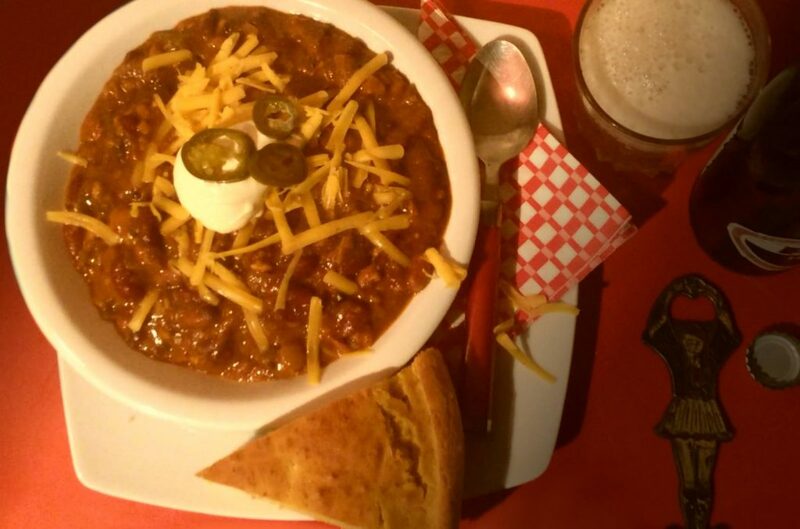 And I’d like to throw in a vote for Tex Ritter’s chili that I cooked for National Cowboy Day 2 years back now. 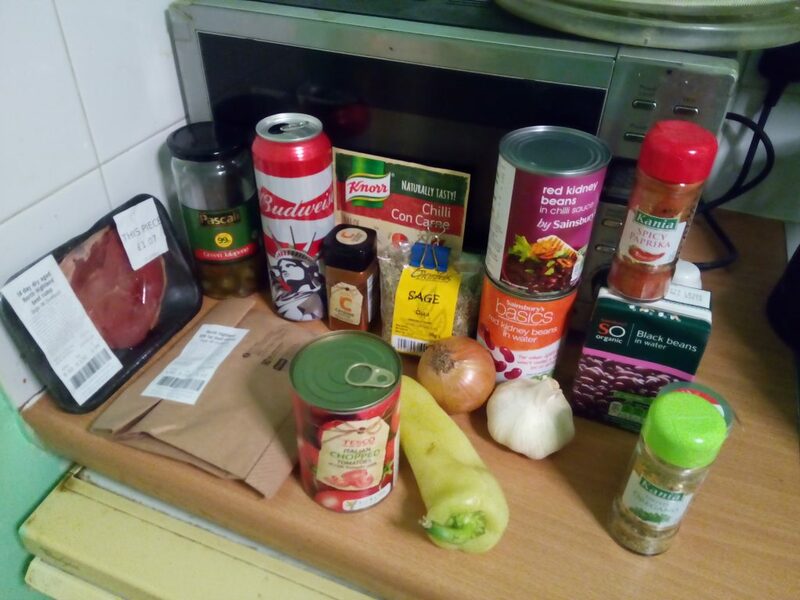 I cooked Chasen’s chili last night . 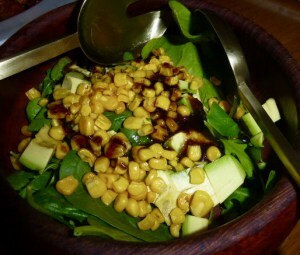 Another stunner which I ate a la Colombo – in a bowl on its own with a bottle of good catsup [ tom ketchup ] to the side . All that was missing was the saltines and a booth in Chasens to eat it in . You are kidding? No rice for you? I agree with you on the cornbread and muffins concept, I want to try both of those too. 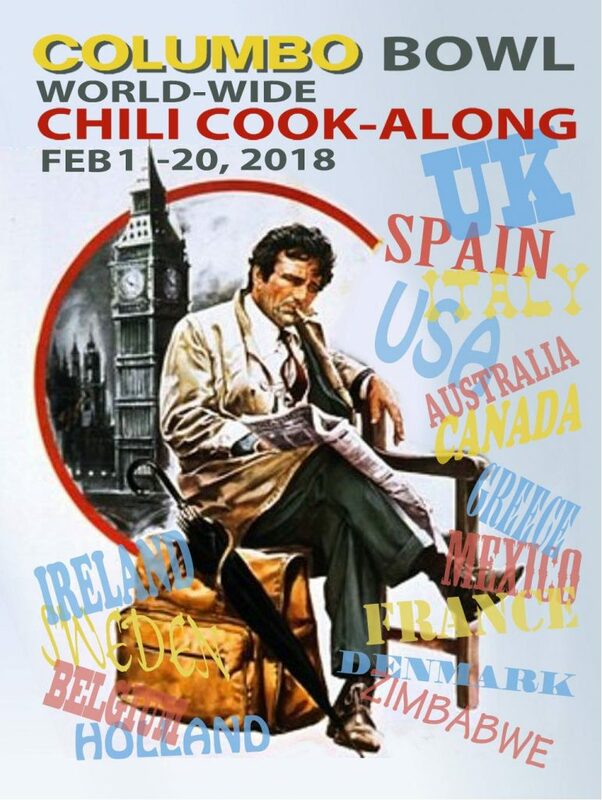 I hereby pronounce you the indisputable King of Movie Related Chili Making. Chasen’s is on my list. I did make it way back when, but for some reason didn’t blog it so will try it again and follow your lead with the ketchup. 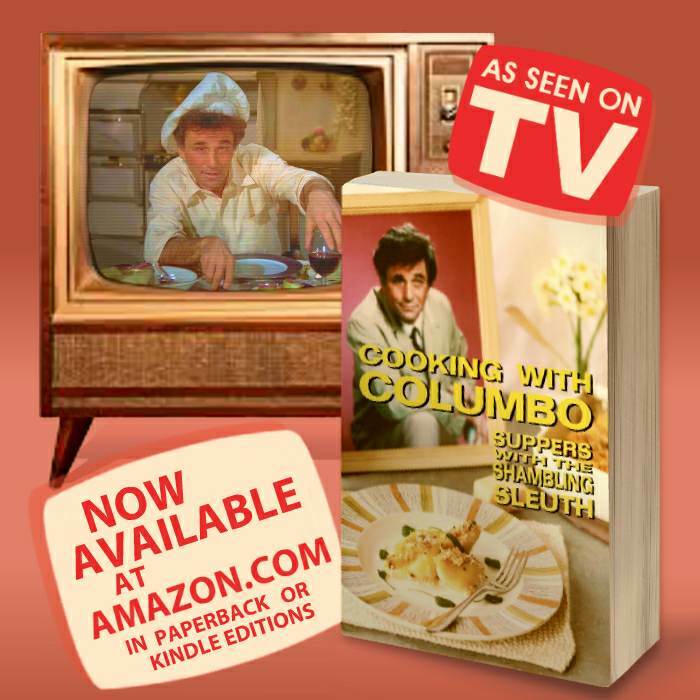 My lovely friend Caroline Frick in Texas brought me some saltines next time she came over so I can make like Columbo. God, I would have loved to have gone to Chasen’s. Loved seeing what everyone else made! 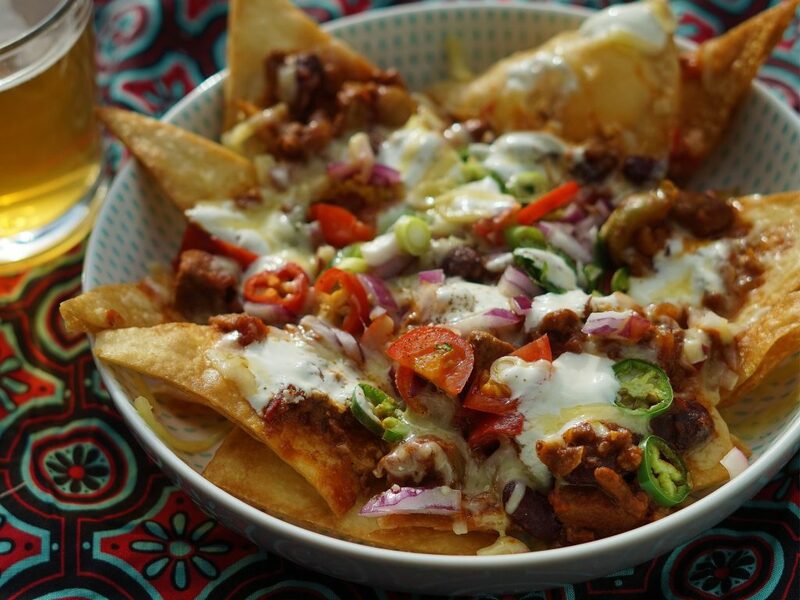 I’d forgotten to buy the sour cream and spring onions to go with my chilli, but it’s those plus cheese and tortilla chips all the way in my house! I’ve got a couple great recipes for cornbread too that I make sometimes- delicious with honey butter slathered on top. Yum! Ooh, honey butter – that sounds divine! 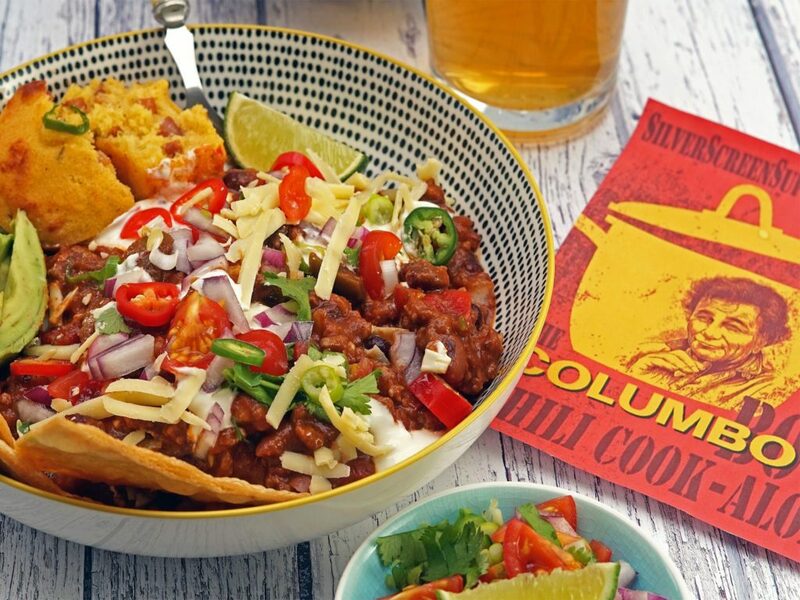 I also like the idea of spring onions with chili – I’ve never thought of that, although I do usually have sour cream about the place! 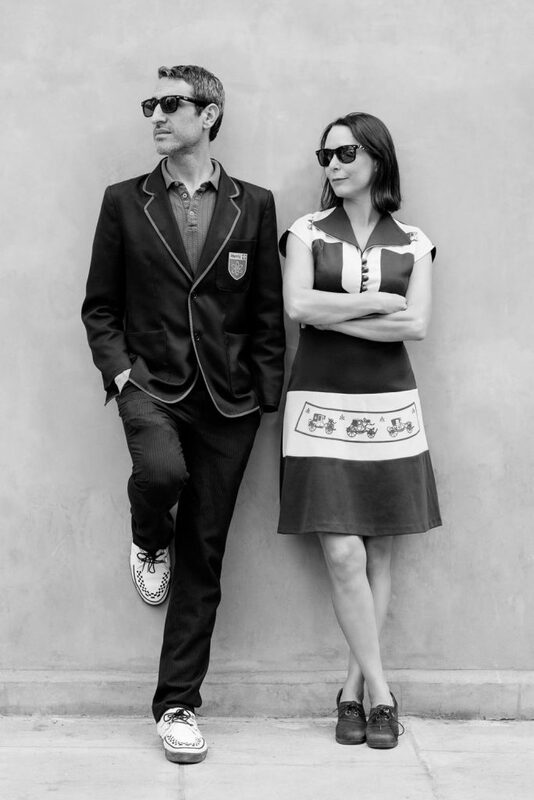 Thanks for joining in – what fun it was!